One by one, the yellow school bus arrived in front of the Hawaii Convention Center. The students were led by their teachers as the doors opened. There were a total of 971 students from 12 schools which include elementary, junior high, high school and special school. The students visited various booths held by the participating groups inside the venue where performances and lectures were taking place. 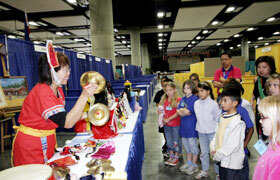 She is Ms. Ginger Kamisugi, who teaches at Our Lady of Good Consul School in Pearl City. The students watched each performance with their shining eyes and asked many questions during the lecture. Some of the participating schools are already encouraging the students to study and learn about the foreign cultures and languages in class, which they were actively engaged in cultural exchange. Also, Mr. Richard Yasukochi who is the Chairman of the Honolulu Daijayama explained about the Japanese ogre which the elementary students asked whether there are good and bad ogres. It was such a peaceful atmosphere where there were many questions and answers. Also, the children looked anticipated to see the Honolulu Daijayama that fires the firework during the Grand Parade. 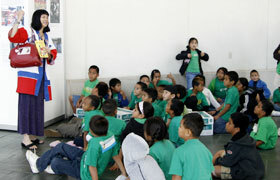 There was a discussion about the different cultures between teachers and students prior to this Educational School Tour. Ms. Ginger Kamisugi, who teaches at Our Lady of Good Consul School in Pearl City led 90 of her students. Under the school’s motto “Appreciate all things and all creations. Respect each other’s culture”, the students learned that there are numerous cultures that exist outside of Hawaii and each of them is sacred. Also, Ms. Kamisugi explained the importance of preserving one’s own culture and tradition to her students. Ms. Jean Ota, who is a teacher at Damien Memorial High School teaches the Japanese language to over 100 students. She thought that this event is a great opportunity for the students to experience the Japanese culture, so she decided to participate. 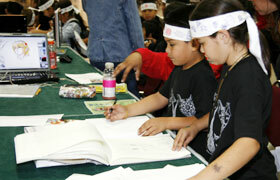 The majority of the students were interested in Ennchi Festival, Japanese mikoshi (portable shrine), Japanese manga and anime. They were actively experiencing the Japanese culture presented in each booth which they challenged to play the difficult shamisen. He is Loren, who is the leader of the Alaskan Native Heritage Center Dancers. The students learned Alaskan native dance called “Air Tanfa” and “Journey” by the Alaska Native Heritage Center Dancers. Everybody did their best and danced happily together. The members participated for the first time. Loren, who is the leader stated “We are very pleased to participate in this opportunity. We believe that each region has its own tradition, which we call it “Masinqa”in Alaskan language. 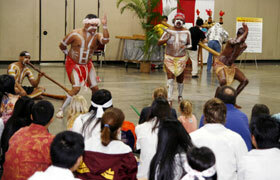 It means that every traditional culture and arts such as dance and clothing has its own meaning. For instance, the hula dance from Hawaiian culture is no exception. We feel very grateful for the opportunity to show the Alaskan native culture to a lot of people.” In addition, the culture of northern Alaska seemed very rare for the children living in the tropical land of Hawaii, which they observed the Alaskan’s warm hat and boots in curiosity. One of the popular booths was by Kawaii Kon, which introduced the Japanese anime and maid cafe. There was continuous number of student visitors which the yellow character named “Kon” from the Japanese anime called “Bleach” was very budy taking pictures with them. Dahlin Stanley, who is the president of Kawaii Kon stated “The Japanese anime is popular around the world including here in Hawaii. There are ample of information on this topic however, I wanted to provide a place for fans to have actual communication and exchange information with each other.” As he stated, the students were interacting and exchanging information with one another by the booth of Kawaii Kon. Furthermore, the students experienced traditions of various cultures including the wild Australian Aboriginal dance, cheerful Taiwanese dance, Japanese bamboo-copter and origami (paper-folding). Also, they experienced the taiko drumming which both the students and teachers said “I would like to visit tomorrow’s public opening as well” as they returned back on the bus. 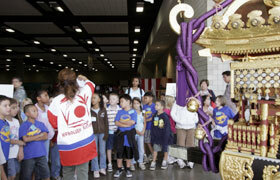 The students listened to the lecture about the Inaho Children Mikoshi which the lecturer was explaining enthusiastically. The members of Taiwan introduced the Taiwanese musical instruments, which the students and teachers were observing them in curiosity. 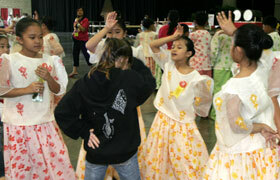 The students enjoyed dancing the Filippino dance with the participating group. Their friendship crossed the border. 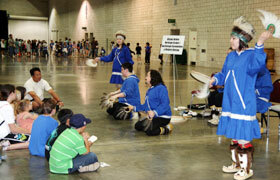 The students were intrigued by Alaskan native dance of the Alaskan Native Heritage Center Dancers. Descendance fom Australia is popular every year. They were the most popular group among the children this year as well. There was a hands-on activity by the booth of Kawaii Kon, where the children can experience sketching the manga illustration. The children were serious about what they will draw.